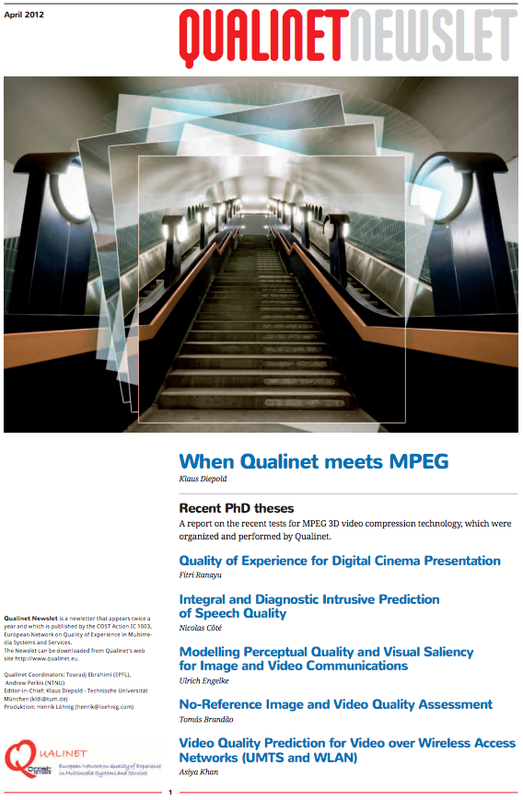 The April 2012 edition of QUALINETs' Newslet provides a report on the recent tests for MPEG 3D video compression technology, which were organized and performed by Qualinet. The QUALINET Newslet is available here! Any comments, feedback are highly appreciated. You might also join our Facebook or LinkedIn groups. Qualinet Newslet is a newletter that appears twice a year and which is published by the COST Action IC 1003, European Network on Quality of Experience in Multimedia Systems and Services. The Newslet can be downloaded from Qualinet‘s web site http://www.qualinet.eu.